Mast of FS Polarstern near Tromso, Norway. Boarding FS Polarstern in Bremerhaven, Germany.. The first person I met when boarding the ship in dry dock was X. After introducing myself as an American scientist to sail the FS Polarstern in stilted if decent German, he revealed to me that he volunteered in the NVA, the soviet-style Nationale Volks-Armee for more than 10 years. Like many low-level Nazis a generation or two before him, he argues that not all was bad in the regime that he served. While this may be true, it strikes me odd, that this is the first things one reveals of oneself and a regime that created walls and killing zones to prevent its own citizens from leaving. Suspecting an uneasy history of guilt, I did not argue despite strong feelings to present different perspectives. Hence his next move is to state that American activities in Europe, Asia, South-America, Middle East, and Africa are the root source of all the problems in these regions. Again, not taking the bait, I listen, ask gentle probing questions to expose more detail, however, not much follows after the first rant that, perhaps, reflects a general feeling more than fact. I heart variations of this theme often in Germany both at sea and on land. Our nurse and stewardess Kerstin also hails from the former East-Germany where she grew up the same time that I did in West-Germany, but unlike X., she embraces life as it presents itself without resentment, regret, or judgment. She signed on for a year working aboard Polarstern for a sense of adventure and to see the world in a different way. She is naturally curious on all things that relate to people, science, and life. She has little interest in politics, ideologies, and theories on how the world works, but she uses her own mind, experiences, and stories to make everyone around her laugh often. People like her should run the world. The second Mate, Felix, was in charge when I boarded the ship. He is probably in his early 30ies and gave me the first tour of the ship in dry dock, a task that revealed a deep pride in the ship, its capabilities, and all it represents in a forward-looking modern Germany. He has clearly sailed to many ports and dealt successfully with people of different countries, cultures, and educations. Despite cursing and cussing of an ol’ salt, he is a hard-working, no-nonsense guy who gets things done efficiently. He also smokes like a chimney and likes to drive the ship while breaking sea ice. He did this often and smartly throughout the expedition. Then there is a fourth group aboard who are perhaps the largest: They are the very young Germans who were born after the collapse of the communist empires in the East and they will become the new Germany. It is a foreign country to me, one I like from the distance, and it is a very young country with much potential to make a positive impact in the world. 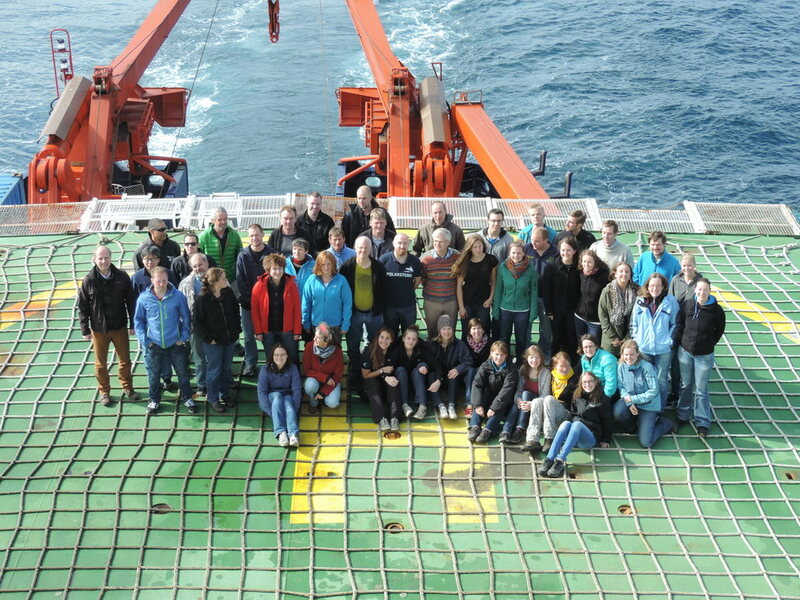 Science party aboard R/V Polarstern after 4 weeks at sea in July 2014. This entry was posted in History, Polarstern and tagged Arctic Ocean, East Germany, Germany, travel. Bookmark the permalink.